Woohoo ~ It's time for a Beach Party! I'm loving how this cute little card turned out ~ so fun! I used the new set from Our Craft Lounge called Life's A Beach! Supplies Used: Stamps ~ Our Craft Lounge (Life's A Beach) and Hero Arts alphabet; Cardstock ~ SU, PTI; Pattern Paper ~ Imaginisce; Trim ~ SEI; Buttons ~ PTI; Sparkly Fluff ~ Our Craft Lounge. 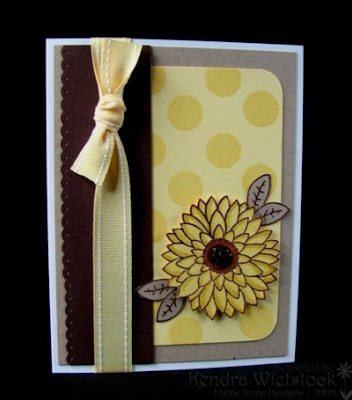 I love how this card came out, but I can't take the credit because I used THIS card, by the amazingly talented Dawn McVey, as my source of inspiration. 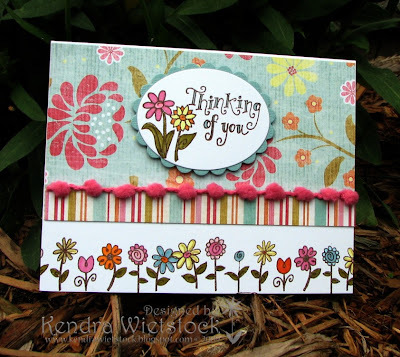 I just changed up the flower to use one from the Garden Inspirations stamp set by Lizzie Anne Designs (can you tell it's my favorite set?). I made it for an anniversary card for our neighbors who celebrated their 51st wedding anniversary earlier this month. 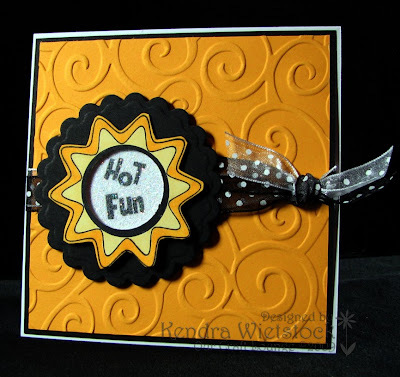 I just love that Lemon Tart paper & ribbon with the chocolate and kraft ~ yummy! Supplies Used: Stamps ~ Lizzie Anne Designs (Garden Inspirations); Cardstock ~ Papertrey Ink; Ink ~ SU, Copics, Versamark; Ribbon ~ Papertrey Ink. 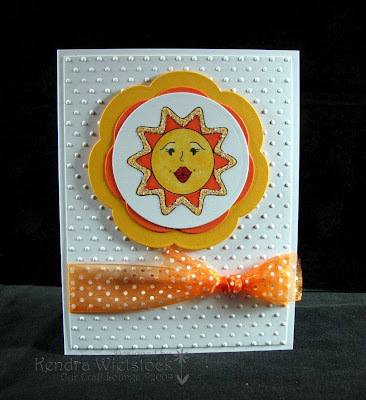 Just had to add some sparkly fun to this Sunkissed card from Our Craft Lounge. 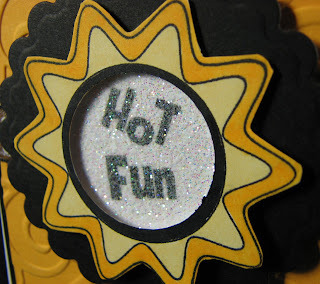 Adding glitter like this is so easy ~ just stamp your image and then run it through a Xyron machine (face down). Dip it in glitter and shake off the excess! The result is GORGEOUS! 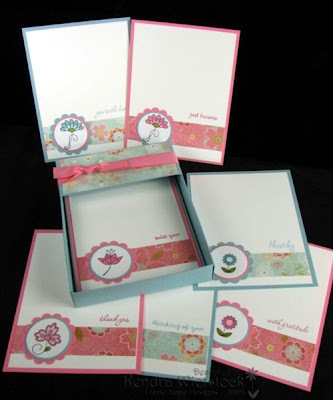 Supplies Used: Stamps ~ Our Craft Lounge (Sunkissed); Cardstock ~ PTI, SU; Ink ~ Palette, Copics; Cuddlebug Embossing Folder; Nestabilities; Ribbon ~ May Arts; Circle Punch ~ EK Success. Tracey from Canada who was my very last entry for the blog candy #200! Tracey, I sent you an email and once I hear from you, I'll forward your addy to Heidi over at Simon Says Stamp. Thanks to everyone who played along and again, sorry for the delay! Actually, I'm still on vacation ~ so I'm sure we're all happy today even if we aren't in the islands. 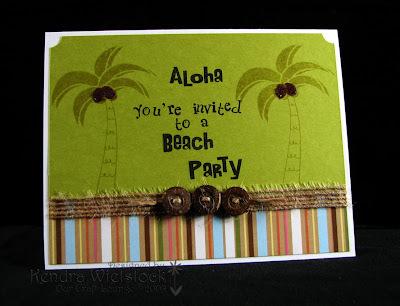 Just a quick card to show you today using the cute Life's A Beach set by Our Craft Lounge! 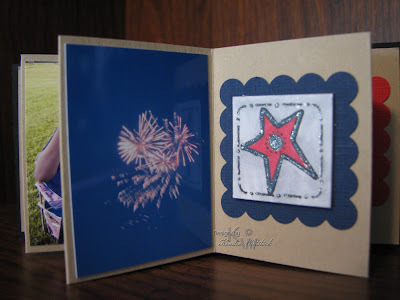 Supplies Used: Stamps ~ Our Craft Lounge ~ (Life's A Beach); Ink ~ SU, Palette; Cardstock ~ SU; Pattern Paper ~ Imaginisce; Trim ~ SEI; Button & Twine ~ PTI. Inchie Friday ~ Going out with a BANG! 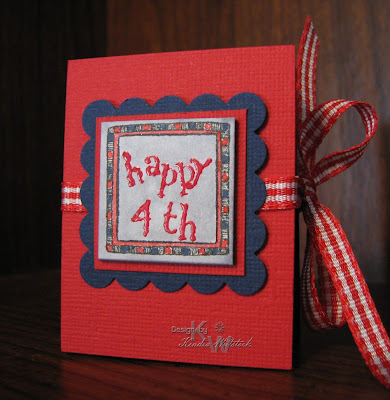 Today's Inchie Arts project is a mini 4th of July photo mini-book. 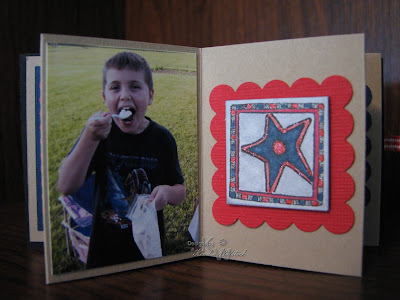 I used the Mini Accordion Book Kit from Inchie Arts (product information is below). This cute little photo book was fun and easy to put together. I found four photos that I took last year on the 4th of July and printed them all on one 4"x6" sheet. Then added them to every other page of the little accordian book. 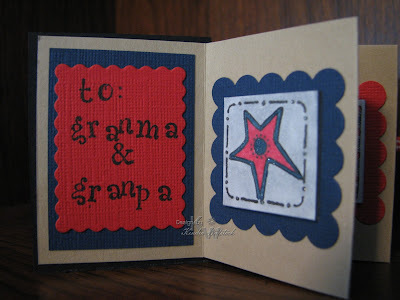 On the opposite sides, are four Star images stamped in black Palette ink and colored right on the Inchie squares. This sweet gift is for Granma & Granpa from my son! Well today it's time to say good-bye to Inchie Arts and this will be my last day for Inchie Friday posts. Thank you to Lisa Lee at Inchie Arts for this fantastic opportunity ~ I have really enjoyed the challenge! Supplies Used: Inchie squares ~ Inchie Arts; Mini Accordion Book ~ Inchie Arts; Cardstock ~ Bazzill; Ink ~ Palette, Copics; Stamps ~ Hero Arts (alphabet) & Lockhart Stamp Company; Ribbon ~ SU; Scallop Square Punch ~ SU. Just a short little post today so get you ready for the upcoming holiday! 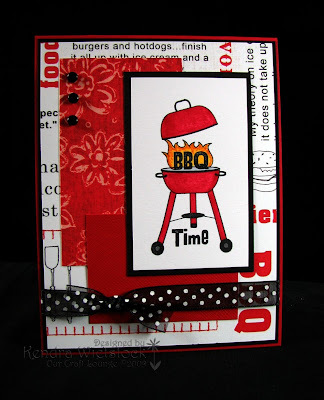 This fun card uses products from Lizzie Anne Designs! 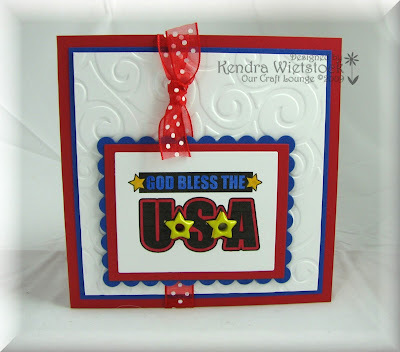 I love this stamp called God Bless the USA and matching digital paper called Stars and Stripes. Supplies Used: Stamps and Digital Paper ~ Lizzie Anne Designs; Cardstock & Ribbon ~ SU; Ink ~ Palette. Well today is the last day of our blog hop ~ hope you enjoyed it. But don't worry, you still have time to enter. We are celebrating Simon Says Stamp's 1st Birthday with a big Blog Hop so the members of the Simon Says Stamp Design Team have had lots of fun things to show you along the way! If you came here from Jo's Blog, welcome! However, if not, you will want to start at the Simon Challenge Blog, so you can win some of the fabulous prizes being offered along the way. AND...there is a mystery puzzle to solve at the end, so make sure you collect the MYSTERY LETTER from each blog ~ the prize at the end is a $100 shopping spree at the Simon Says Stamp store ~ FABULOUS!!! Not only is there a prize at the end of the blog hop if you collect all the mystery letters, but I have blog candy too! 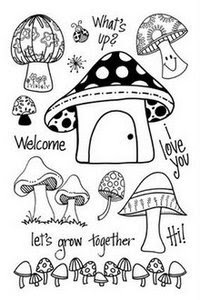 It's an Exclusive set from Simon Says Stamp called Mushrooms Grow Together ~ isn't it CUTE? 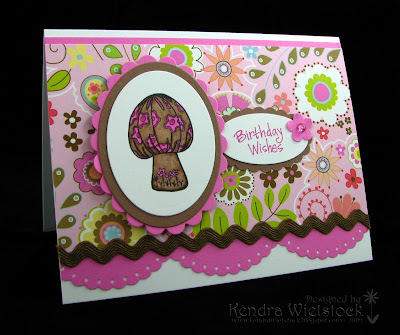 Here is a birthday sample just for the occasion ~ totally fun!! Edge Punch ~ EK Success; Ric Rac & gems. And here is the cute set you can win! And the next stop on the blog hop is ~ Lorraine! 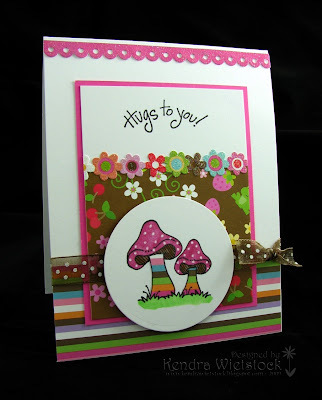 Welcome back to the blog hop celebrating the 1st Birthday of Simon Says Stamp! 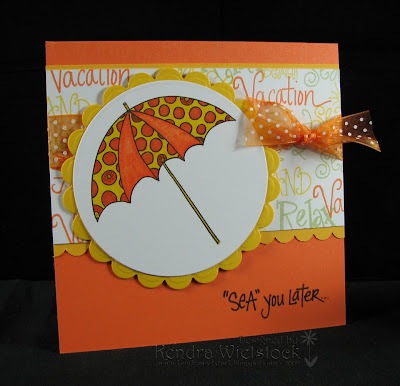 My project today uses one of the Exclusive sets from Simon Says Stamp called Relax Vacation! I used the words in the set to create the fun pattern paper behind the main image! Not only is there a prize at the end of the blog hop if you collect all the mystery letters, but I have some blog candy too! It's an Exclusive set from Simon Says Stamp called Mushrooms Grow Together ~ isn't it CUTE? I'll have another sample up with it tomorrow & I did one yesterday if you missed it. Are you still on the hop? You have until Wednesday to enter for all the blog candy! We are celebrating Simon Says Stamp's 1st Birthday with a big Blog Hop so the members of the Simon Says Stamp Design Team have lots of fun things to show you! Not only is there a prize at the end of the blog hop if you collect all the mystery letters, but I have blog candy too! It's an Exclusive set from Simon Says Stamp called Mushrooms Grow Together ~ isn't it CUTE? Simon Says ... It's time for a Blog Hop & CANDY! WOOHOO!!!! I'm on vacation but I'm still playing along this week because it's time to celebrate Simon Says Stamp's 1st Birthday with a big Blog Hop! The members of the Simon Says Stamp Design Team have lots of fun things to show you over the next few days! 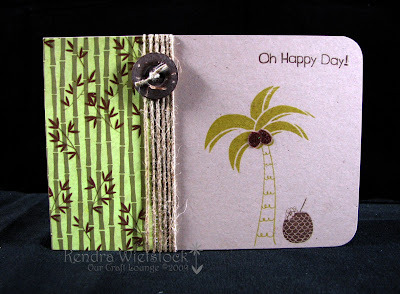 My project today uses one of the Exclusive sets from Simon Says Stamp called Relax Vacation! It's a perfect set for scrapbooking. Can you think of a better thing to do during the summer than going to the beach and building a huge sand fort? 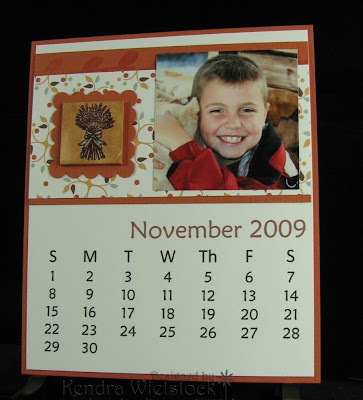 These pictures of my son were taken several years ago, but I remember it so clearly. He stayed out building in the sand from dawn until dusk ~ he had a blast! Ink ~ Versamark, Palette, Copics; Cricut Cartridge ~ Alphalicious. Not only is there a prize at the end of the blog hop if you collect all the mystery letters, but I have some blog candy too! It's an Exclusive set from Simon Says Stamp called Mushrooms Grow Together ~ isn't it CUTE? I'll have a sample up tomorrow with it! Leave a comment anywhere on my blog to win for this cute little set & I will pick a winner on Wednesday, June 24th at 2pm. YOU MUST LEAVE CONTACT INFORMATION with your post or have contact info in your Blogger profile! If you don't, I will pick a new winner. Just a little kiss for you today using a set from Our Craft Lounge called Sunkissed ~ so cute! Can you tell I'm into polka-dot and really any dots? We could really use some sun ~ it's been dreary and raining for the past several days! We are leaving for Mt. Rushmore and Yellowstone today, so I'll be on here now and then over the next few weeks with trip updates. Don't worry, I have brand new stuff scheduled to appear each and every day ~ I've been working very hard to get everything done in time for our trip! Supplies Used: Stamps ~ Our Craft Lounge (Sunkissed); Cardstock ~ PTI & SU; Ink ~ Palette, Copics; Ribbon ~ Michaels; Cuddlebug embossing folder; glitter. Inchie Friday ~ Final Calendar Pages! 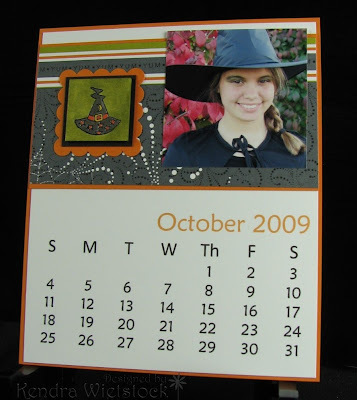 It's Inchie Friday once again & today I have the rest of my calendar pages to show you! Woohoo ~ a project done! I adore this picture of my daughter on Halloween last year. She went out as Elphaba (the Wicked Witch of the West from Wicked ~ our favorite musical). I also love this picture of my son, so I had to use it again. And finally a Christmas picture ~ a wonderful memory. Each of these little white Inchie squares are all embossed with pigment ink and then embossed with clear embossing powder and then colored with Copic markers. Supplies Used: Inchie Squares ~ Inchie Arts; Cardstock ~ SU, PTI; Pattern Papers ~ SU & MME; Ink ~ SU, Copics; Punches ~ SU, EK Success; Calendar grids ~ Excel spreadsheets created by Kendra. Hey Chick-a-dees! It's time for a little surfin' today! These cute little images are from the new set called Life's A Beach from Our Craft Lounge. 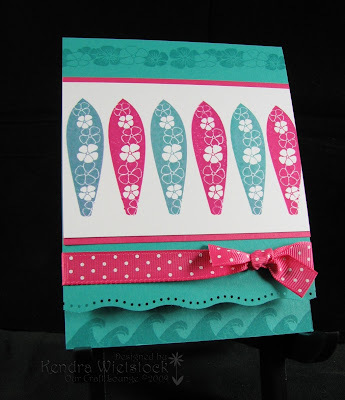 I also snuck in some of the new cardstock and ribbon (Bermuda Bay & Melon Mambo) from Stampin' Up! ~ aren't they YUMMY? This card was super EASY PEASY! 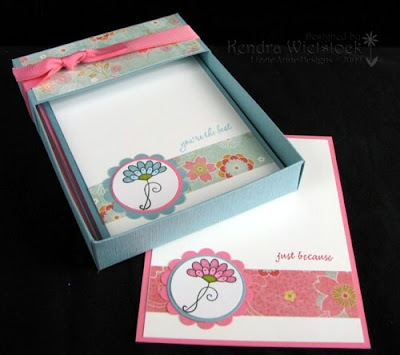 Supplies Used: Stamps ~ Our Craft Lounge (Life's A Beach); Cardstock, Ink & Ribbon ~ SU; Edge punch ~ EK Success. Simon Says ~ Challenge Day! 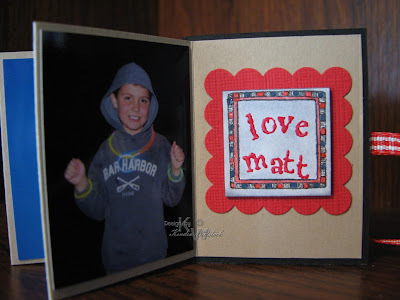 Today is challenge day over at the Simon Says Stamp Challenge Blog & I am in the Designer Spotlight. Let's see today's challenge is #9 & the challenge was to do Flowers! I can definately do flowers ~ no problem there! Go take a look at the fun Challenge Blog and see what you come up with! 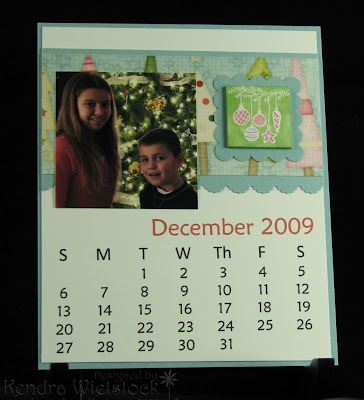 Just leave a link to your project and you might win a fabulous prize from Simon Says Stamp! Supplies Used: Stamps ~ Simon Says Stamp (Simply the Best Sentiment set & With Deepest Sympathy set); Cardstock ~ PTI; Pattern Paper ~ My Mind's Eye; Ink ~ Palette, Copics; Trim ~ Making Memories. Our Craft Lounge ~ Spotlight Set of the Week! It's time to start thinking about your 4th of July preparations & this stamp set from Our Craft Lounge called All About the USA is just perfect for the occasion! There are so many great images in the set that are not only great for Independence Day, but also for cards to our heroes in the armed forces. AND... this set happens to be our Spotlight Set of the Week ~ so go check out the OCL Forums for lots of great samples and links all this week. 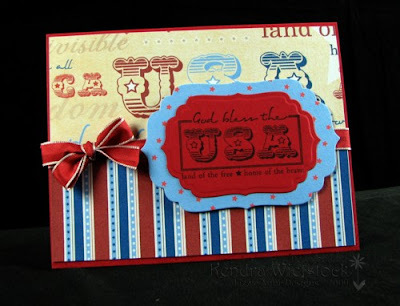 Supplies: Stamps ~ Our Craft Lounge (All About the USA); Cardstock ~ SU, PTI; Ink ~ Palette, Copics; Star Eyelets ~ Eyelet Outlet; Nestabilties; Cuddlebug Embossing Folder; Ribbon ~ May Arts. OK ~ Now I can show you this to you! I had it posted a few weeks ago and I should have waited until my friend Val had her class, so I pulled it off. Well she held her class on Saturday and NOW I can share mine again. I'm super happy with how it came out ~ such a fun project. Lizzie Anne is moving all our inventory to a bigger facility, and they need to move some product before packing it up. So they are having a HUGE inventory moving sale through the end of Wednesday, June 17th! Everything in the online store will be 20% - 50% off (excluding digital paper). This is a rare opportunity to get those Lizzie Anne stamps you've been wanting at a discount...an event not to be missed! AND ~ All orders over $50 will receive a FREE surprise stamp! Supplies Used: Stamps ~ Lizzie Anne Designs (Le Jardin & Everyday Sayings); Cardstock ~ SU & PTI; Pattern Paper ~ My Mind's Eye; Ink ~ Palette & Copics; Ribbon ~ SU. It's summer time ~ woohooo! Nothing says summer to me more than bright colors and flip-flops! This cute image is from a set called Relax Vacation from Simon Says Stamp. This set has some great summer images for cards and for scrapbooking as well. Supplies Used: Stamps ~ Our Craft Lounge (Sunkissed); Cardstock ~ PTI, Doodlebug; Pattern Paper ~ Adorn It (BBQ Collection); Ink ~ Palette & Copics; Ribbon ~ May Arts.